KANSAS CITY, Mo. (AP) — Multiple injuries were being reported Tuesday evening after a suspected gas explosion sparked a massive fire that engulfed an entire block at an upscale shopping center in Kansas City. Police spokeswoman Rhonda Flores said it appeared that a car crashed into a gas main near a restaurant at 6:03 p.m. Flores said injuries were reported but that did not know how many or how severe. She noted an initial call for three ambulances had been increased to 10. She said she had not heard of any reported fatalities. Flores said the car crash appeared to have been an accidental. Kerry O'Connor, a spokeswoman for St. Luke's Hospital, which is near the scene of the fire, said several patients were on the way to the hospital. She said they haven't been assessed yet but "they appear to be critical at this time." Fire officials didn't immediately return a phone call seeking comment Tuesday evening. 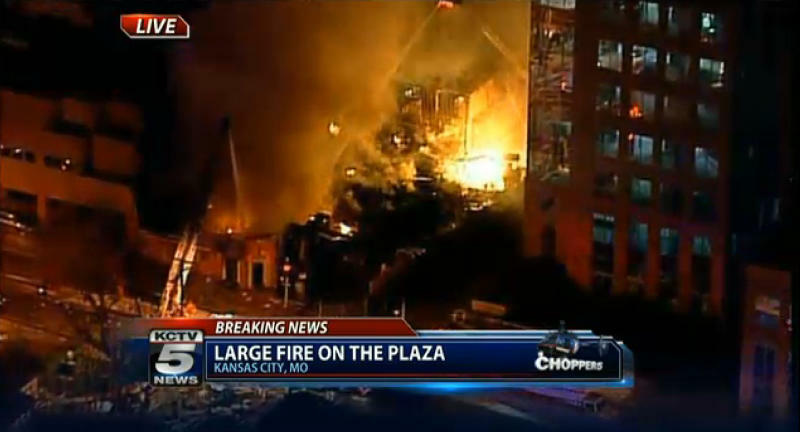 The, but television video showed flames shooting out of the Country Club Plaza. The smell of gas was very strong near the area long after the suspected explosion.